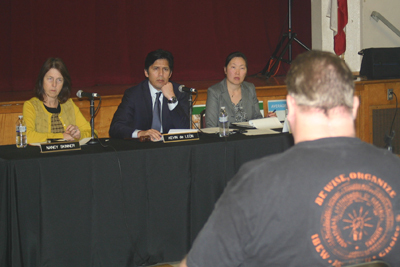 A government body beginning discussions on the implementation of voter-approved Proposition 39 — a new income tax on multi-state businesses that will create revenue for clean energy projects — met at Murchison Elementary School in Boyle Heights on Feb. 21. Natural lighting, modern ventilation and heating and cooling systems were some of the upgrades needed at Los Angeles area schools, like Murchison located near the Ramona Gardens Public Housing Complex, discussed during the Fiscal Oversight and Bonded Indebtedness meeting convened by Senate Appropriations Chair Kevin de León, who has also introduced legislation, Senate Bill 39, as a way to award energy efficiency upgrade grants from the funds generated by the new tax to the most economically disadvantaged schools in need of modernization. Modernization will not only improve the health of students in the classroom, it will also promote a better learning environment and have large, positive ramifications for California’s workforce, according to a statement released by Leon. For the first five years, half of the revenues generated under Prop. 39 will go to the job-creating, energy efficiency and clean energy programs implemented by legislation. The other half will be used to help schools devastated by years of cuts. After five years, all of the revenue generated will go to the General Fund. The subcommittee meeting included panelists from education, labor, business and environmental organizations who discussed ways to spend the more than $2 billion in energy efficiency funds expected to be generated by the initiative. In addition to creating jobs for Californians, De León says passage of SB 39 will bring about long-term energy cost savings for schools, which will then be able to put the money saved back into the classroom. The legislation will also help shrink the state’s carbon footprint and reduce pollution creating cleaner air, among other goals. Los Angeles Unified School District’s (LAUSD) utility bill for 2011-2012 was $105 million, with electricity alone costing $83 million, according to LAUSD Chief Facilities Executive Mark Hovatter. By retrofitting schools that are currently not energy efficient, about $20 million (about 25%) could be saved and instead be used to support teachers in the classroom and other efficient district operations, Hovatter said at the meeting. Ron Miller, Executive Secretary Los Angeles/Orange Counties, CA Building and Construction Trades Council, AFL-CIO, said the revenues would create badly needed jobs for unemployed construction workers. Retrofitting California’s public schools could potentially create 66,00 good jobs and apprenticeship opportunities, he said. Other panelists included Mary Luévano with Global Green; Richard Luke, Director of Design and A/E Technical Support, Los Angeles Unified School District; Dr. Jorge Partida, Executive Director, US Green Building Council – L.A. Chapter; and Nidia Bautista, Policy and Legislative Affairs Director, Coalition for Clean Air, who focused on accountability mechanisms for school construction programs, current funding and programs, and the auditing process, oversight and accountability necessary for success.